Well, I thought last year was busy, but this year was the busiest so far. We got off to a good start in November researching membership software and implementing it. This took countless hours and although we found out that the program did not meet our needs, many valuable lessons were learned and hopefully it will be our foundation for a future program to streamline our membership process. Our largest committee, the Trail Building and Maintenance Committee was in full swing looking ahead at potential new safety regulations we felt would be implemented by our government. We put money aside for chainsaw safety courses and approved all of our trips for the upcoming trail season. We also hired some interns to help with some grants and investigated charitable status but determined we just don’t have the organizational capacity to implement it, yet. Throughout the winter we spent time building relationships with Parks, exploring a relationship with the Army Cadets. We also signed a partnership agreement with Recreation Sites and Trail BC, to become the official trail operator of the David Thompson Heritage Trail in the upper Blaeberry valley. We also spent time talking with some of our corporate sponsors like the North Face who moved our organization up from the local level to National, including not only support with clothing for our Board Members and Volunteers, but hard dollars for trail work. We also applied and received the largest grant to date from Mountain Equipment Co-op, another long-term supporter. We also did some grant writing and many hours were spent by our Outreach Committee getting ready for our big spring fundraising event with Brian Keating, and our first ever pub night. We also took time to survey our board members and started working on long term strategies. Although our membership has leveled off, our email distribution list now reaches 825 people. The Brian Keating event was a huge success, hard not to be when you have the most exciting speaker in town, raising $8,000 for the GDTA. This was great timing as it was budget time and the trail work planning was in full swing. The late spring also came with good news at the Castle Parks Management Plan was finalized ensuring permanent protection for our trail within the new parks. During the summer months Alberta Parks even had trail crews working on the GDT in the park and installing our new reassurance markers. Big thank you to Julie MacDougall and the rest of the team at Alberta Parks! The good news kept rolling as the Livingstone and Porcupine Hills Public Land Use Zone (PLUZ) was also finalized, protecting our trail within it. The new recreation plans look great and work has already started to change this part of the province. Spring was also busy trying to get the Crowsnest Chapter off the ground with an information evening in Coleman drawing over 50 people. Then jumping right into the madness of complying with Alberta Occupational Health & Safety requirements and Parks approval of our safety plan at the last minute. This couldn’t have happened without some extreme work put in by our volunteers on the safety committee and the heavy lifting by the Greater Bragg Creek Trail Association. Summer – ready, set, here we go! 11 trips involving over 100 volunteers. Think about that for a moment, an organization with 250 members gets 100 volunteers out working for it, pretty impressive I have to say. We had 7 trips along the new section called the High Rock Trail, including building a 38-foot natural timber bridge as well as another engineered timber bridge, built with the support of Alberta Environment and Parks. Kudos to Brad Jones and the team down in Blairmore for your continued support. Then a walking trip on the original section of the GDT from Fording River Pass to Tornado Pass, maintaining the centerpiece of our trail, clearing 300 downed trees, installing new reassurance markers, and assessing future trail maintenance priorities. 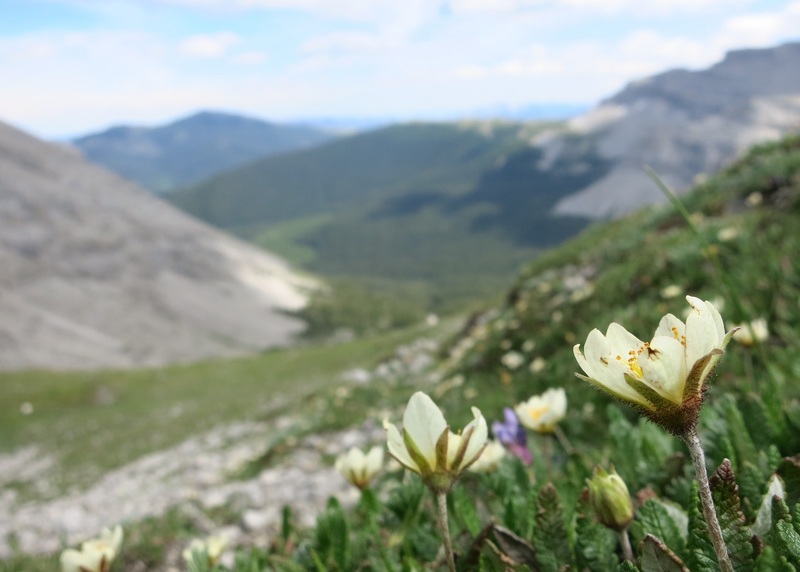 Next up was the first ever trail maintenance trip in a National Park, working with the Jasper Trails Alliance to clear a section of the Maligne Pass Trail in Jasper National Park. Then, we moved on to the David Thompson Heritage Trail near Golden BC, 8 kilometres of this historic trail were restored to its former glory. Following that, a 4-day scouting trip was completed to ensure we are ready for another busy year in 2019. And finally, the very first Crowsnest Chapter trail building trip near Window Mountain Lake. Our GDT Trail App was also updated with more accurate route data and new alternates. You can’t believe the number of hours this takes to make it look so simple and easy to use! We had another summer of periodic trail closures due to a bad wildfire season, but that did not stop record numbers of thru-hikers, estimated at more than 50 in 2018, along with hundreds of section hikers. As well the 3rd edition of Dustin Lynx’s ‘Hiking Canada’s Great Divide Trail’ guidebook was released in July. I can’t say enough thanks for the support of our board members, sponsors, parks partners and of the volunteers who made this all happen.